Amy Dell joined the Licking County Foundation full-time in December 2015 as the Program Officer. She is responsible for the creation, oversight and management of external programs, including grants, scholarships and special community initiatives. Her role allows her a view of the enormous generosity present in Licking County, as all of the grants and scholarships are made possible because of caring donors from all walks of life. She considers it a privilege to help award these funds. 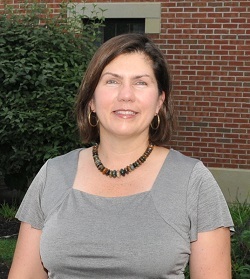 Prior to joining the Foundation, Amy worked for fifteen years with Big Brothers Big Sisters agencies in Ohio, and ten years with youth service organizations and schools in Vermont. Amy holds a Bachelor’s degree in Psychology, a Graduate Certificate in Nonprofit Administration and Management, and a Master’s degree of Education. Amy lives in Granville and is the proud mom of two daughters, Cecilia and Maggie Reinhardt. In her community, Amy currently serves as a trustee for the Granville Education Foundation and coordinates childcare volunteers for her church. She enjoys spending time with family, exercising with friends, volunteering with her kids’ activities, working the crossword puzzle, singing along with all types of music, and being in the great outdoors. Fun fact: She has climbed El Castillo in Chichen Itza!